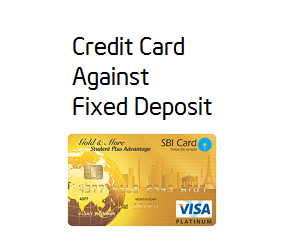 Credit card against fixed deposit - Good option? Home » Credit Card » Credit card against fixed deposit – Good option? Credit card against fixed deposit is an option for the people with a low-income group and bad credit history. One of my relatives has recently got a job as GET in one company. He was looking for a credit card, but as his yearly income was low credit card company rejected his application. Incidentally, he came across an offer of Credit Card against fixed deposit and decided to avail the same. He used a credit card for two months. As he was impulsive buyer he soon exhausted his credit limit and due to money crunch he was unable to repay the credit in time. Finally, he ended up losing his fixed deposit saving to repay this credit. This incident has taught him a valuable lesson about pro and cons of credit card usage. Today you will find many people prefer to go for credit card against fixed deposit. This post talks about various credit card against fixed deposit option and benefits, drawbacks associated with it. What is Credit card against fixed deposit? Credit card against fixed deposit as the name indicates it is credit card provided against the value of fixed deposit. Anyone with a fixed deposit in the bank can avail these type of card. No documentation or credit score checking is required to avail this card. The bank offers this type of credit card with a low-interest rate as it is completely backed by the fixed deposit. If you are unable to pay your credit dues in time bank hold rights to close your FD to recover the defaulted amount. How Credit card against fixed deposit works? A credit card against fixed deposit is a normal credit card with credit limit of 80-85% of the principal fixed deposit amount. Once a credit card is assigned to you the amount of your fixed deposit will be marked with lien till you return back credit card to the bank. If you failed in clearing credit dues in specified time. The bank can recover the unpaid amount from the fixed deposit. 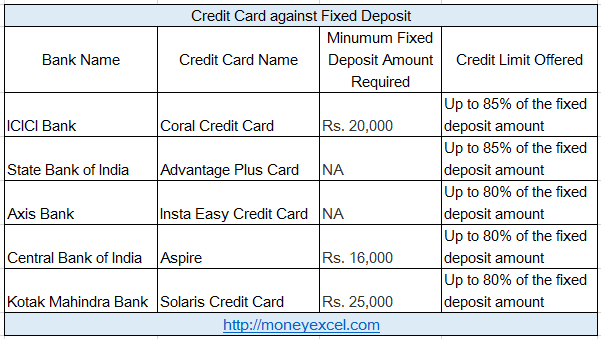 Some of the popular credit card options against fixed deposit are given below. Note – Annual fees, joining fees and other charges are applicable on these credit cards also. Instant approval, fewer documents are required to avail this credit card. No income proof is required to avail this credit card. You will surely get credit card irrespective of your credit history. Low-interest rate compared to normal credit card option. Fixed deposit interest payment will continue irrespective of credit card usage. It is win-win product for bank and end user. It is card offered against your fixed deposit saving. You cannot close your FD unless you clear the credit card dues. Overuse of credit card and not paying in time will destroy your saving. Credit card against fixed deposit is very good option for the people who are facing problem in availing regular credit card. If you plan to avail it, you must ensure that you are making payment of your credit in time to save your fixed deposit saving. Do you use Credit card against fixed deposit? Do you think it is a good option? Do share your views/experience in the comment section. You got card or yet waiting for response. nice job dear, well done………….